Track Listing: 1. Teenage Riot, 2. Silver Rocket, 3. The Sprawl, 4. ’Cross the Breeze, 5. Eric’s Trip, 6. Total Trash, 7. Hey Joni, 8. Providence, 9. Candle, 10. Rain King, 11. Trilogy: a) The Wonder, b) Hyperstation, c) Eliminator Jr. I was understandably pumped about my third row tickets for a Neil Young & Crazy Horse show. Up until then, it was the closest I had gotten to my idol and favorite live band. But before that was to take place, there were two warm-up acts to “get through.” The first to hit the stage was Social Distortion, who put on a damn good show that certainly felt a cut above what I had come to expect from warm-up acts. I had never seen Sonic Youth and, embarrassed as I am to say now, didn’t know much about them before that night except that my brother (who was sitting next to me for the show) was a huge fan. This was slightly over two years after Daydream Nation was released so I had no excuse to be in the dark as I was. They wandered onto the stage quietly and unassuming, an understated entry that hardly prepared me for what was to follow when they unleashed an attack like nothing I had ever seen or heard before. It was an explosion of raucous chaos. There were bizarre tunings framing guitar exchanges that were in synch not only with one another but also with the ever-expanding fuzz of feedback that now bounced around the arena. Three different singers took over at different times. I wasn’t exactly sure what to do, what or who to focus on, or what exactly was happening. Later, I would come to understand that what they were doing was planting seeds that would change the course of my music-obsessed future. It was not only the beginning of Sonic Youth taking over the throne as my new favorite band but the night also opened my eyes and mind to explore other sounds and music that clearly electrified me. I am not sure I would have ever given the Minutemen Minutemen a chance, for example, or pogo’d my way into punk music’s back catalog as unabashedly as I later did. Which, looking back, begs a question that I found myself repeating a lot through my life: just where the hell had I been? It’s as if I was always the last to arrive to the party. There will always be change. A new world order is always waiting, ready to cease the spotlight. Nevertheless, when it happens—the paradigm shift—it never ceases to amaze or inspire. And so it was that Sonic Youth shifted the axis for me. The date was January 29, 1991. It was a cold Tuesday night in Rosemont, Illinois, when an unmistakable intensity penetrated an arena and my brain alike. If I had a white flag, I would have happily waved it from my seat in surrender. With Daydream Nation, Sonic Youth’s fifth album, that same live show thunder is captured neatly in a studio album proving that no barriers existed in this brave new alt rock world. The energy of their live show onslaught is made accessible via a studio recording, ready to explode through home speakers at your leisure like magic, and without a Ticketmaster surcharge. 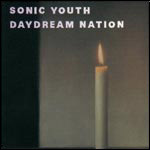 As I jot down these thoughts today, I consider that it has been almost 20 years since the release of Daydream Nation. The warp of time never ceases to amaze. But unlike the sonic feedback from a show that dissolved into my ringing ears for days that followed, there is nothing distorted or faded in the emotions that continue to rise in me when I hear this album or, for that matter, when I hear any one of Sonic Youth’s expansive catalog of treasures.